[I suppose most would assume I would blog about the Royal Wedding today, but I figure that as the rest of the world is talking about it, I will refrain]. I hate grocery shopping. I mean I really hate it. It’s up there with waiting in a three-hour line at the post office while the guy in back of me sneezes into my hair. For starters, going to the supermarket requires mixing with the fray, and you know how I feel about that. And it’s not just the fray, it’s a very large dose of them who are harried, hungry, and pushing large metal carts that hurt like hell when some idiot runs into you from the back and you’re wearing sandals. Then there are the choices that one must make, and often by the time I get to the store, I am far too tired and the notion of making yet one more decision feels like pulling teeth. ‘Are you going to buy this brand, or that one? This is more expensive, but this tastes better; wait a minute, this contains that chemical stuff, and this one is good for the environment. Oh, stop the presses, this one is on offer two for one!’ Crap. You see, it is a surefire recipe to increase your blood pressure and drive you insane. 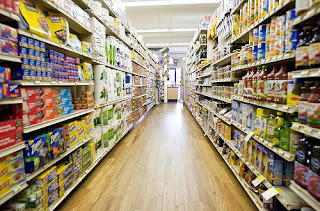 And of course you can go with a list as most do, but don’t plan on sticking to it, especially when you wander down that aisle that you usually don’t go down and see four new brands of crackers that all promise to increase your wholegrain intake. Then there is the supermarket lighting system that always makes you feel like you are trapped in The Shining, and of course, like any good germ freak, there is the fact that you are touching things that every one and their brother has touched, drooled on, manhandled, and probably tampered with. Ah, joy. My partner always wants to go to the store on the weekend. In all fairness, it’s our only time to do it. [And as he is a kind man, he knows that sending me and the King during the week would mean I would most likely get arrested for battle ramming my cart in the produce aisle cause someone body checked me near the pineapple display]. So we go to this massive market in the more ‘interesting’ part of town, shall we say, and on a Saturday morning it basically feels like a stadium full of ornery football fans is there with us ready to mess your a** up if you steal the melon they had their eye on. My partner dives in excitedly like he’s going into battle; on the contrary, I end up wandering around the aisles getting increasingly overwhelmed clutching one or two items like a panicked freak, while my partner moves through the aisles with uncanny precision with a price comparison excel spreadsheet on his phone to know that he’s truly getting the best bargain. Yes, this is serious business – for him anyway. Funny enough, one of my funniest memories with my father was a time we went grocery shopping in Las Vegas. Needless to say, my dad liked to shop at 3 a.m (which actually is much more palatable and amusing I must say) and this meant that the store was usually filled with individuals that either rode the pole for a living, or were incredibly eccentric at best. Not sure why this hour brings out the loons, but I suppose if one is heading to the store to buy a can of gasoline, some duct tape and a rope, 4 a.m. is the time to do it. I must clarify, that was NOT our shopping list that night, so put down the phone, you do not have to alert the authorities. My Dad’s method of shopping is to go down the aisles and knock pretty much everything into the cart that looks sinful (thankfully since then, his tastes have become much healthier). That particular night I was gasping in awe (and horror) at some of the items he was choosing, asking who the heck was going to eat that? His stock reply was that his housekeeper, Emma, liked the triple stuffed chocolate ho-hos, not him of course. Apparently Emma liked absolutely everything –and had an appetite similar to Jabba the Hut. I have to admit, although my dad's zest for shopping far exceeds mine, I think he has the right idea about the hour. Perhaps I shall introduce the King to late night shopping, I have a feeling that I could leave him in the cereal aisle with an open box of cereal while I did the weekly shop and he'd be just fine.